The Framed world of The Fairground Booth. More work on the film the last few days as well the book. 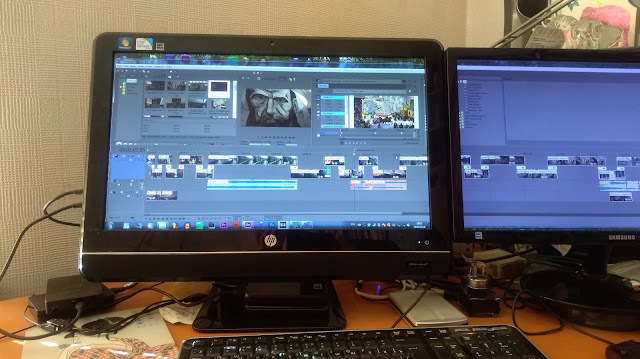 Re editing material for the book especially the neo platonism section Over the last week we attended a kabuki theatre production here in Moscow. Meyerhold was strongly influenced by Kabuki theatre and I am now beginning to see why this so. It has a naivety accompanied by a sophistication which is often unappreciated. The fairground Booth in its fist performance was also much misunderstood and denigrated. However it contains many innovations which became part of contemporary theatre as we understand it today. "The Fairground Booth" has an aura of childlike naivety, however, this innocence is also accompanied by the grotesque of the commedia dell'Arte. The purpose is to disorientate the audience, to make them aware of the unnaturalness and theatricality of what they are seeing. 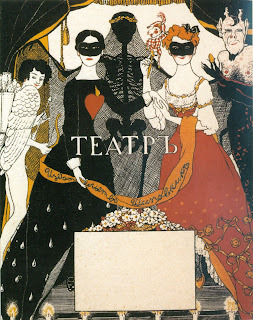 All kinds of framing devises were used by Meyerhold in these commedia type plays, "The Fairground booth" and "Columbina's Veil" to draw attention to the fact that this is not real life. For instance servants were used to perform certain functions like opening stage curtains and helping actors with various tasks, including them in the action in new and unusual ways certainly unusual for the time. 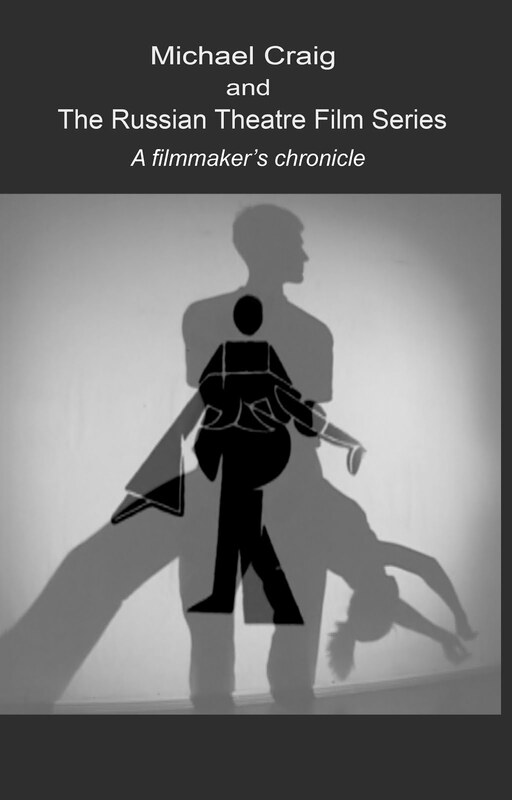 Such framing devises and the fact that the plays are framed within the grotesque, contribute to the sense of another world or another plane of reality other than that to which we are used to seeing in the theatre opening the way to other understandings and sensations in the audience. The sense of the real world being conditioned by a sense of fantasy and grotesque leads the audience to start to make their own interpretations about what they are seeing and in this sense participating and even molding the play's sense. The puppet like quality of The Fairground Booth (The alternative title for Blok's "The Fairground Booth" was "The Puppet Show") also suggests another state of being or other possibilities for the characters and the action of the play. 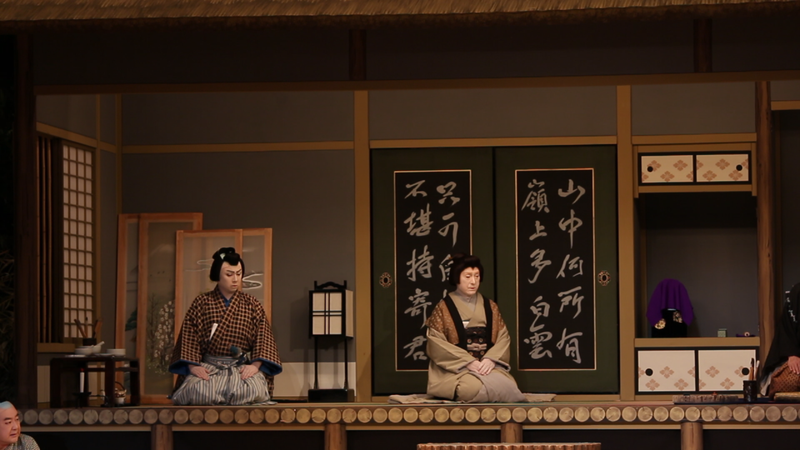 The Kabuki play "Yoshinoyama"where the actors playing the roles Shizuka and her loyal servant Tadanobu, directly and explicitly points to an art form and a situation outside the play. Tadanobu is firstly not human but is a fox disguised as a human. In one fragment the two characters freeze in pose of a husband and wife paper dolls which stand in the homes of Japanese families as symbols of filial loyalty. The fact that they become frozen as dolls for several moments builds layers of meaning recognized and contributed to by the knowledge and cultural sensitivities of the audience who will make connections to cultural variants outside of the play. The important thing here is that the fact that this is part of the play is also deliberately exposed. The device itself for referencing a particular element is displayed as a device. For Blok, the Cosmos as a subject underpins the apocalypse - as in the fall of the stars and the heavens crashing to earth. The very multilayeredness of themes invokes and multiplies new themes, directions, openings and expansions. 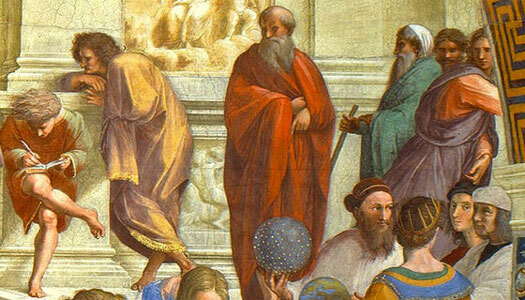 Plotinus and the Eclectic School - a detail from Raphael’s “School of Athens” featuring Plotinus. 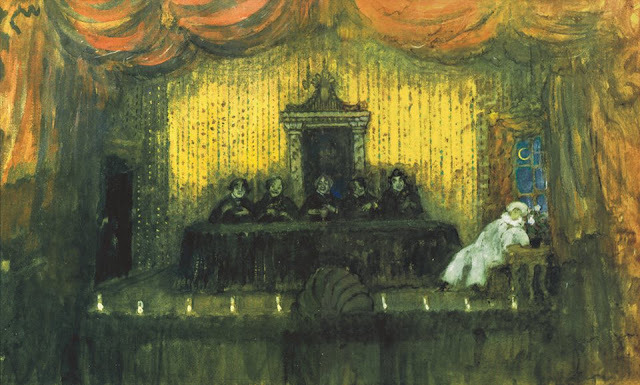 Prospero's metaphor applies not just to the pageant he's created , but also to the play Shakespeare presents in the Globe Theatre—the "great globe itself." Dramatic illusion in its turn becomes a metaphor for the "real" world outside the globe, which is equally fleeting. Towers, palaces, temples, the Globe theatre, the Earth—all will crumble and dissolve, leaving nothing behind. Prospero's play within a play (The Tempest) within a another play which is the "real" world. "The stuff of dreams" seems only to superficially resembles Prospero's purpose. "The stuff of dreams" refers to the materials that go into creating an illusion and the materials themselves are it seems also an illusion. The whole concept of The Tempest is a subversion of reality, a descent into a dream like state which poses as reality and is indistinguishable from our "waking life". It is a question that Descartes, the instigator of modern thought, posed by asking how do I know that all that I know and see and think is not merely a dream. The Tempest also explores this theme. Blok in The Fairground Booth also explores this theme in the context of theatre of his own time, drawing attention to the deficiencies of the perceptions of reality as expressed through theatre and the need for a new theatre with new forms to reflect a new reality or changes in our perception of reality brought about by a crises in culture and science. 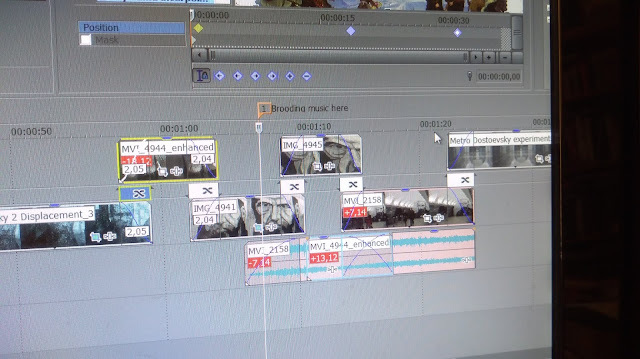 Each epoch has to do this. The dream allows for a re evaluation or new appraisal of reality through a perusal of the relationship between illusion and reality. Poetry, art and in our case theatre are ways of addressing these questions. 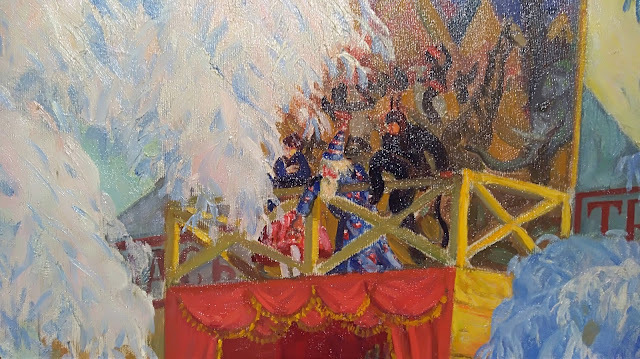 In the context of the Fairground Booth project the traces of Neoplatonism in Shakespeare's Tempest could confirm the influence of The Tempest on The Fairground Booth itself. I am working on this assumption in order to explain some of the themes of the play. A few days ago I visited the opening of the exhibition of Vsevolod Tarasevich at the Photography Centre MAMM near Kropotkinskaya in Moscow. I have already blogged about this opening which can be viewed here. However there was an element in the exhibition which relates to The Fairground Booth project and is worth mentioning here. 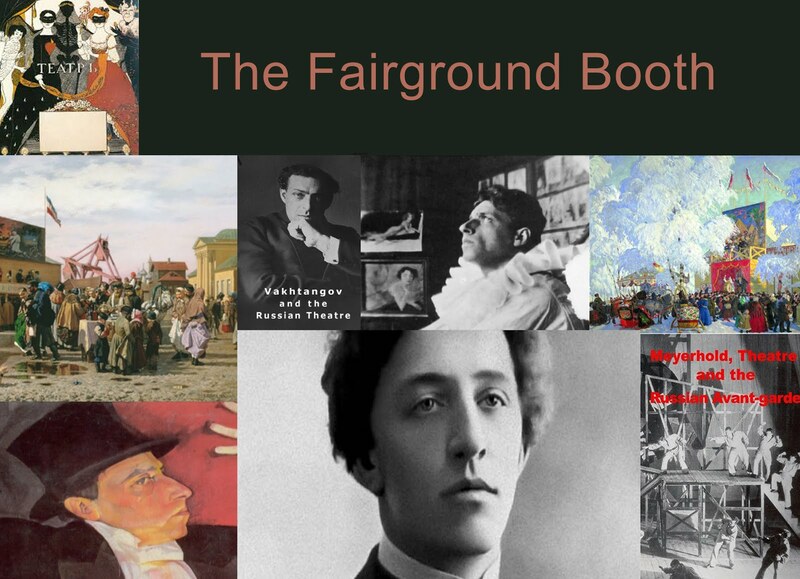 A parallel exhibition was taking place of Boris Kustodiev - both his photographs and his paintings I was familiar with his paintings because they will feature in The fairground Booth film in the section which will explain the role of the Fairground in Russian Theatre. The Russian Revolution of 1905, which shook the foundations of Russian society, evoked a vivid response in the artist's soul. 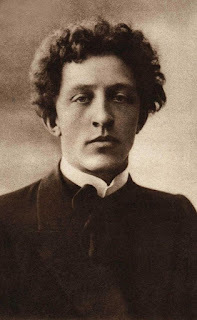 He contributed to the satirical journals Zhupel (Bugbear) and Adskaya Pochta (Hell’s Mail). At that time, he first met the artists of Mir Iskusstva (World of Art), the group of innovative Russian artists. He joined their association in 1910 and subsequently took part in all their exhibitions. The artist was also interested in designing stage scenery. He first started work in the theatre in 1911, when he designed the sets for Alexander Ostrovsky's An Ardent Heart. Such was his success that further orders came pouring in. In 1913, he designed the sets and costumes for The Death of Pazukhin at the Moscow Art Theatre. 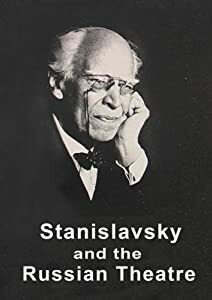 His talent in this sphere was especially apparent in his work for Ostrovsky's plays; It's a Family Affair, A Stroke of Luck, Wolves and Sheep, and The Storm. The milieu of Ostrovsky's plays—provincial life and the world of the merchant class—was close to Kustodiev's own genre paintings, and he worked easily and quickly on the stage set. He also photographed provincial Russia in the early days of photography around the 1900s. 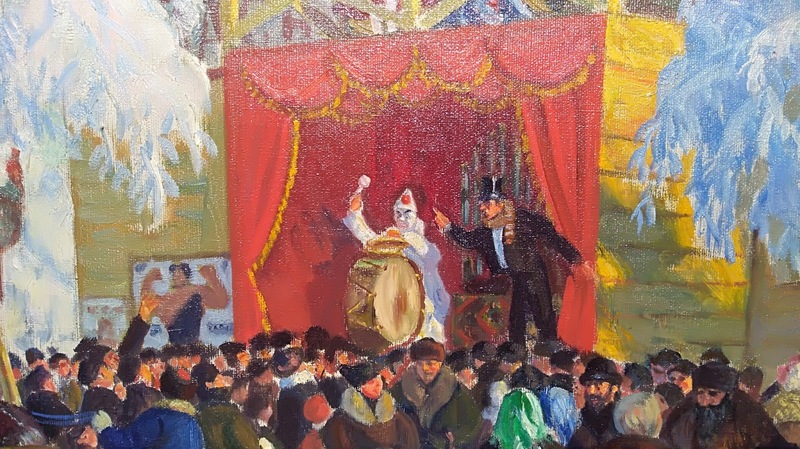 My interest is in his paintings of the Russian Fairground. Kustodiev concerned himself with both painting the Fairground and theatre set design and is ideal for the film The Fairground Booth. 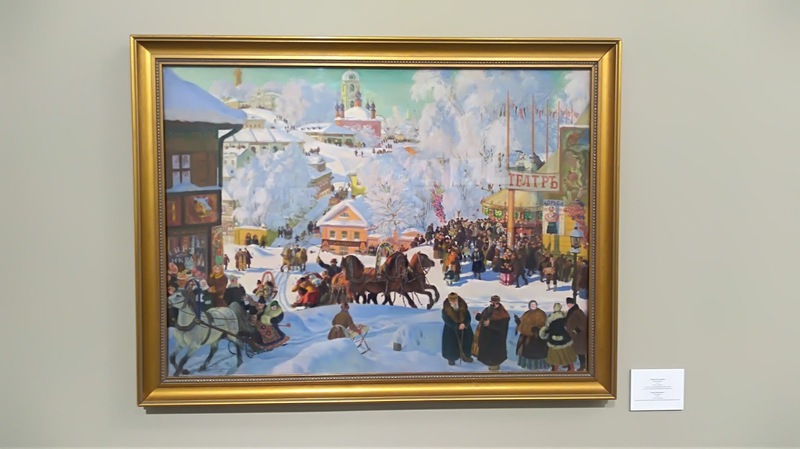 His paintings are a visual witness to what the Russian Fairground looked like at that time and therefore have a documentary element.